Finn Geotherm has installed the first district heating scheme in the East of England for housing provider Flagship Group. 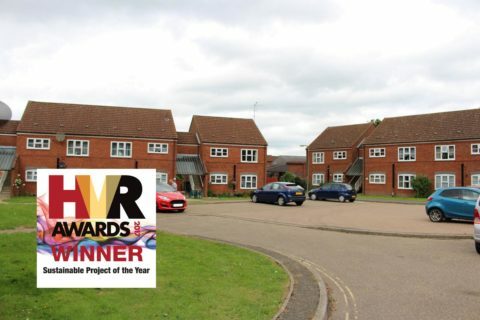 The ground source heat pump is delivering domestic heating and hot water for 30 flats at Orchard Close in Watton, South Norfolk. It will cut Flagship customers’ heating bills by two thirds, creating annual savings of hundreds of pounds. The project was undertaken as part of Flagship’s Wellbeing Plan for continual improvement in energy use and carbon emissions. The scheme was needed to replace existing electric economy 7 storage heaters, which were inefficient and expensive to run. Finn Geotherm specified two Lämpöässä Eli 60 60kW ground source heat pumps linked to a 2000 litre thermal store, with all equipment located within an external plant room. Facilities management company Aaron Services installed the radiators and accompanying equipment. The system runs off a central heat pump, with each flat having its own hot water radiator circuit and hot water tank. A separate heat meter is installed in every flat so the tenant is charged for the heat they use. Separate Ofgem heat meters in the plant room facilitate the required RHI meter readings. By operating twin heat pumps with a thermal store, the system will continually deliver heating and hot water even during maintenance. The external plant room enables servicing to be done without disturbing tenants. Each stage of the installation was undertaken with utmost care and created minimal disruption for tenants. Groundworks saw individual block paving stones and grass turf lifted and meticulously re-laid after works were completed. No flat was without heating or hot water during the project. The flats can now be fully heated without big bills, delivering associated benefits such as positive impact on health by reduction in damp and improved air quality. AWARD-WINNER! This project was awarded the prestigious title of Sustainable Project of the Year in the HVR Awards 2017.